Reiki is hands on energy healing which was rediscovered in the March of 1922 by Dr. Mikao Usui of Japan. Since then Reiki has developed and spread and is practiced all over the world. Reiki is a pure form of healing and balances the Emotional, Physical and Spiritual needs of the body, inducing a feeling of peace and relaxation. This in turn allows the body to heal itself with its natural healing abilities. Reiki is very simple to learn and anyone can learn Reiki. One does not need any qualifications to learn Reiki; it is simply passed on from the Reiki teacher to the student. 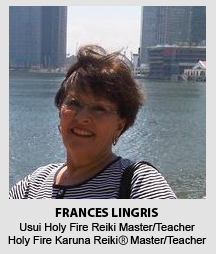 Frances learned Usui Reiki and Karuna Reiki® in South Africa from Sarita Mathur, an Indian national, who trained under William Lee Rand, the founder of the International Centre for Reiki Training in the United States. He also devised the very powerful method of advanced Reiki training called Karuna Reiki® (the Reiki of compassionate action) and thereafter a further form of Advanced Reiki called Usui Holy Fire ll Reiki and Holy Fire ll Karuna Reiki®. Frances has taught Reiki in Singapore, South Africa and Vietnam. Her Reiki training began in 2005 qualifying as a Usui Reiki Master/Teacher as well as a Karuna Reiki® Practitioner. After relocating to Singapore in 2008, she completed her Karuna Reiki® Master/Teacher training under Debbie McDougall from England. In 2014, after 5 years in Singapore Frances relocated to South Africa and then on to Mozambique and now commutes between these two countries. She returned to Singapore in 2015 to learn a further advanced form of Reiki called Holy Fire Karuna Reiki® Master/Teacher under Thong Swee Kam and Qua Chee Loong both of whom trained under William Lee Rand. In 2016 Frances upgraded to Holy Fire ll Karuna Reiki® with William Lee Rand. Whilst living in Singapore, Frances taught Reiki to students from countries within South East Asia who travelled to Singapore from Japan, Jakarta, Malaysia and China together with giving Reiki treatments and Reiki distant healings, many of whom were cancer patients. In 2014, she was honoured to be have been invited to teach Reiki in Vietnam. She also gave Reiki treatments weekly as a volunteer at the Singapore Red Cross Home for the Disabled where extra Reiki hands are always welcome. Aside teaching Reiki and doing Reiki treatments and Reiki distant healing, she does Online Angel Card readings and a variety of workshops. Frances is registered as an Affiliate member with the International Center for Reiki Training in the USA.